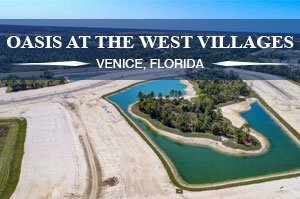 Oasis at West Villages offers one of the most ideal locations to live in Venice, Florida. Its site spreads snugly on the junction of the Tamiami Trail (U.S. 41) and North River Road at the southeastern edge of the master-planned West Villages which has emerged as amongst the leading search destinations for Venice homes for sale. This community is the youngest out of the seven distinct residential developments in West Villages. Its builder, the Columbus, Ohio-based M/I Homes, unveiled design choices and pricing of Oasis homes for sale in early 2018. Some older homes for sale in West Villages notably predate by a decade the new choices at the Oasis. The residences of the Oasis are all single family homes set on 60- and 70-foot wide lots. M/I has platted 135 lots for the initial phase of this community, with ample room still left for expansion. The ready home sites all nestle amidst a nature reserve space with tranquil ponds and well-groomed pathways. M/I Homes offers nine Oasis home designs to choose from, with one amongst them coming as a two-story floor plan. These residential choices feature floor areas measuring from 2,180 up to 3,759 square feet. Available with three to five bedrooms, these residences are priced the $300s‒$400s range. 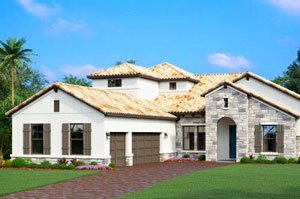 Their features include open floor plans, tile roofs, outdoor living spaces and three-car garages. A rendition of one of the home designs at Oasis, the Crystal, is a showcase of M/I’s superiority in homebuilding. A built-up Crystal model entered in the 2018 Sarasota‒Manatee Parade of Homes came out as best overall in its category. Priced starting from the high $300s, it was also adjudged as best in kitchen, master suite, floor plan, and architectural detail. The Oasis at West Villages is a fenced-in enclave with two gates on the southern Tamiami Trail side of the property. It also features an amenity center with a swimming pool. Living in this community offers access to thousands of acres of nearby parks and trails including those on the fringes of the Myakka River just east of this community. Directly across south of it too is the local campus of the State College of Florida. As another come-on for Oasis homes for sale, the planned town center of West Villages is likewise only a short walk from the community. This mixed development on the southwest quadrant of Tamiami Trail and West Villages is set on 626 acres and approved for retail space of 300,000 square feet and office space of 200,000 square feet. Adjacent to this town center, the spring training stadium of the Atlanta Braves is set for a 2019 inauguration which should add to the delights of living in the West Villages. 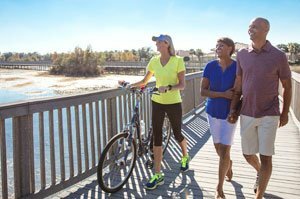 More life and leisure activities are easily accessible via a westward trip on the Tamiami Trail. The arterial roads of this highway corridor lead to the quaint city downtown in the island of Venice. The popular local beach is also in this area as well as the Venetian Waterway Park, one of the top ten bike trails in Florida. It features two trails along a 10-mile stretch of the 10-mile park, parallel to the Intracoastal Waterway, another enticing attraction to own a home in the Oasis at West Villages. Below are the current real estate listings available at Oasis at West Villages.